Vestibular rehabilitation is a type of therapy that focuses on improving the relationship between the inner ear, brain, eyes, muscles and nerves. 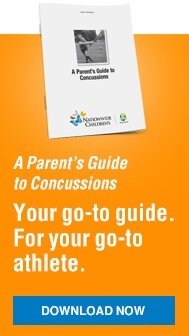 This therapy is typically used with post-concussion patients here at Nationwide Children’s Sports and Orthopedic Physical Therapy. During evaluation, the physical therapist will look at balance, strength, range of motion, eye movements, mental awareness and positional testing. From there, a plan of care will be developed with treatments individualized to the patient’s needs. What is Assessed During a Vestibular Evaluation? Although each patient’s treatment plan will be different, most patients can expect to be in therapy 4-8 weeks, with sessions once or twice per week. Initially, therapy will consist of simple exercises that focus on improving dizziness and reducing neck pain or tightness, while not increasing other concussion symptoms like headaches. As the patient’s symptoms begin to decrease, treatments will become more complex, combining balance exercises with vestibular activities, focusing on return to maximum function. The ultimate goal is to get patients as close to symptom free as possible, and back to sport or activities.